Find out which beloved Star Wars character may return. According to a report from The Daily News J.J. Abrams wants Yoda to appear in "Star Wars: Episode IX" (2019). One of the biggest surprises of "Star Wars: The Last Jedi" was Yoda's "Force Ghost" bringing Luke Skywalker (Mark Hamill) to his senses. According to the newspaper "insider source," the producers are "planning to bring back Yoda". "The success of the scenes featuring Yoda in 'The Last Jedi' were huge," says the anonymous insider. "If all goes according to plan, the sci-fi space sage will rejoin the series in spirit to mentor a young warrior played by British actress Daisy Ridley". 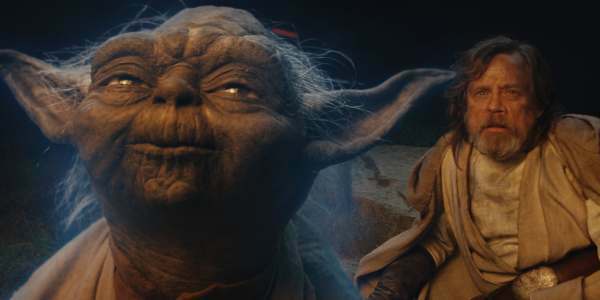 The article says "Yoda will again appear as a ghost as he acknowledges Rey's success and growth as a Jedi. The scenes are due to be put together later this year." In the two "Star Wars" movie sequels, they established that Rey is powerful in the Force but untrained. Luke spent time training her in "The Last Jedi" but being trained by a Jedi Master would send her skills to the next level. Although we're not sure what he'll teach her. After destroying the sacred Jedi texts Yoda said, "Wisdom they held, but that library contained nothing that the girl Rey does not already possess." So, what else does she need to know? Yoda is a 900-year old master of the Force, an energy that "binds all things" and allows the Jedi to complete superhuman feats. He was performed and voiced by Frank Oz in 1980 and he returned for the prequels and sequels. In "Star Wars: The Empire Strikes Back" Yoda trained Luke Skywalker in the ways of the Force and the prequel films "Star Wars: The Phantom Menace" and "Attack of the Clones" showed Yoda training young Jedi apprentices known as "Padawans". Will Yoda have Rey lifting rocks and X-Wing fighters? Difficult to say. Always in motion is the future. Check back with the Geek Twins for more Star Wars: Episode IX movie news! Are you glad Yoda is coming back? Who else would you like to see return to the Star Wars sequels?